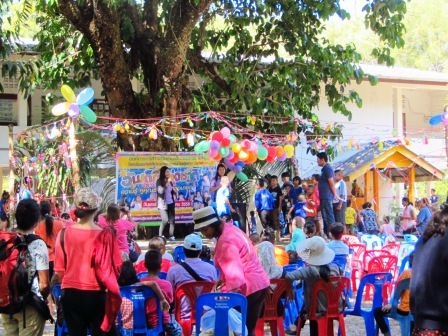 Ban Talae Nok School was filled with fun and laughter during their annual Children’s Day celebration. The students played fun games and performed songs and dances on the stage throughout the day. The celebrations brought presents and smiles to all the children there. The Community Fund of the Ban Talae Nok Tourism Group generously paid for the delicious chicken and rice. On January 10th, the Tung Dap community celebrated a joyous Children’s Day under blue skies and the shade of beautiful trees. The children laughed as they played games, sang songs, and performed dances on stage beneath an arch of colorful balloons. It was great to see so many children and their families enjoying the day together. The Northern Andaman Network Foundation (NAN Foundation) provided some funds for gifts and food. 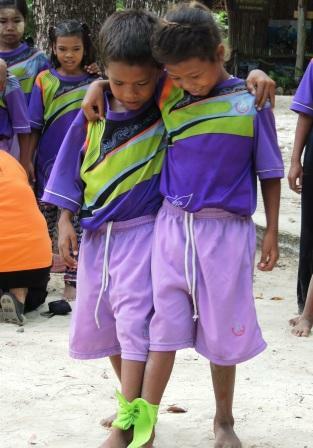 The beaches at Koh Surin National Park were filled with the laughter of the Moken Children as they played games like tug of war and the three legged race. The young Moken girls performed a beautiful traditional dance with beautiful smiles on their faces. A highlight was when the Thai Navy attempted to row the Moken traditional rowboats. Everybody on the beach was giggling and cheering on their team! The Northern Andaman Network Foundation (NAN Foundation) sponsored the ice cream for the kids and enjoyed participating in the activities!